Finally, a GPS system for screenwriters! The potentially long and arduous journey of writing a screenplay was just made easier to navigate with The Screenwriter's Roadmap. Avoid the wrong turns, dead ends, gaping p(l)otholes, and other obstacles that result in frustration , wasted time, and wasted energy. The Screenwriter's Roadmap keeps you on track and helps you reach your destination- a finished, professional quality screenplay. 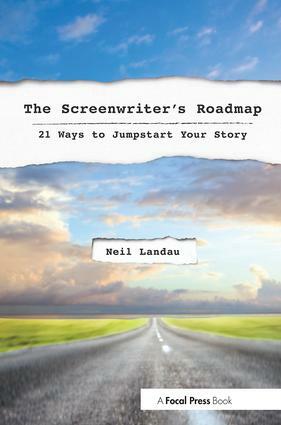 Neil Landau, a successful Hollywood screenwriter and script doctor with over 2 decades of experience, provides you with 21 Guideposts, that if implemented, will help you nail down your screenplay's story structure, deepen its character arcs, bolster stakes, heighten suspense, and diagnose and repair its potential weaknesses. These Guideposts are based on field-tested, in-the-trenches experiences that have been proven to work. The Guideposts are augmented by interactive exercises, end of chapter "homework" assignments, examples from the latest blockbusters, as well as over 20 interviews with some of Hollywood's most successful screenwriters and directors, including David S. Goyer (Batman Begins, The Dark Knight, The Dark Knight Rises, Man of Steel), David Koepp (Jurassic Park, Mission: Impossible, Spider-Man, Panic Room, War of the Worlds, Angels & Demons), Melissa Rosenberg (The Twilight Saga: Twilight, The Twilight Saga: New Moon, The Twilight Saga: Eclipse, The Twilight Saga: Breaking Dawn - Part 1, The Twilight Saga: Breaking Dawn - Part 2, Dexter (TV)), and Eric Roth (Forrest Gump, The Insider, Munich, The Good Shepherd, The Curious Case of Benjamin Button, Extremely Loud and Incredibly Close).